Kids gather to make Lego robots; teens create digital music, movies, and games with computers and mixers; and students engineer new projects while adults create prototypes for small business products with laser cutters and 3D printers. Many libraries across the US have developed makerspaces—places to create, build, and craft—and they are experiencing increased visits and demand as a result. For public libraries, they are places to promote community engagement. For academic libraries, they are places where students and faculty feel welcome to do classwork and research. Fundamentally, makerspaces are a technological leap past library knitting and quilting circles, where patrons and experts have often come together to learn new techniques and train others in a skill. The new tools are a lot flashier, and certainly more expensive than a needle and thread. The cost factor is what makes a makerspace so appealing to library visitors—what one person cannot afford to purchase for occasional use, the library can buy and share with the community. 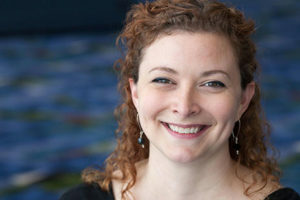 The ALA 2012 Virtual Conference featured two well-attended makerspace sessions. 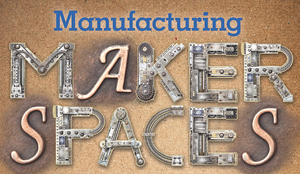 The ALA Midwinter Meeting in Seattle offered more makerspace know-how, including Maker Monday. In the next few sections, you’ll find expert opinions and advice from author Cory Doctorow and Make Magazine writer Travis Good, as well as practical pieces on the costs and resources involved. Tools in a library makerspace range from electronics to digital media, 3D printing, and more. While the variety of products and space configuration is vast, the approach to implementation is not. Here are a few makerspace models that work. Jeff Krull, director of Allen County (Ind.) Public Library (ACPL), identified partnerships as a key ingredient to developing a successful project. While he can’t pin down the exact day they joined forces, Krull and Greg Jacobs, president of TekVenture, met several years ago, and a partnership blossomed. Jacobs outfitted a 50-by-10-foot trailer; wired it for phone, power, and internet; filled it with tools; and then parked it in a lot across the street from the library. ACPL’s costs are less than $200 a month for utilities and other services. Together, TekVenture and ACPL developed a summer program schedule. The library promotes the TekVenture Maker Station while TekVenture delivers the makerspace programs. Topics run the gamut from basic robot assembly and circuit bending to holography and welding, totaling more than 50 classes. In addition, Maker Station is home to weekly maker meetups and the place where library staff receive hands-on exposure to making. What’s next for ACPL? “I’ve come to the conclusion that if we’re really going to have a library makerspace, then we need to get past the Maker Station very quickly. It’s too unavailable across the street and its open hours are too limited. We need to do something inside the library building itself,” Krull said. Cleveland Public Library’s approach centers on its Main Branch, where ideas are developed and tested and then rolled out as appropriate. The library system launched TechCentral on June 14, 2012, building out 7,000 square feet and consolidating technology from two buildings. TechCentral features a computer lab with 90 workstations (there are 120 HP Thin Clients throughout the library); circular tables to encourage meeting, interaction, and collaboration; and a “Tech ToyBox” with iPads, Kindles, and other technology. There’s even a 3D printer. Working with HP and Citrix, Cleveland Public Library built a MyCloud service that includes Microsoft Office. MyCloud provides a personal desktop persistent across sessions and available to each library card holder older than 17. The 14-member TechCentral team “are all trained library assistants but filtered for technology prowess,” C. J. Lynce, TechCentral’s manager, said. Team members offer free computer and tech topic classes and one-on-one training sessions. TechCentral’s $1 million launch was funded primarily through existing budgets: The library centralized computers and added a few new ones, and redeployed library employees. It also partially funded the MyCloud and Tech ToyBox through corporate partners. The facility itself was formerly housed in the AV department. What’s next? “We want to introduce the whole maker idea at a basic level. We’ve purchased K’NEX Kits, littleBits, Crawling Microbug robots, soldering irons, and various hand tools. We’re doing this because we want to ignite that spark in patrons’ minds to see where it takes them,” Lynce said. Tod Colegrove, director of the DeLaMare Science and Engineering Library at the University of Nevada in Reno, used a strategy of deliberate opportunism to create his library’s makerspace. “It was the only way we could bring about any change. There was no funding. The state of Nevada was in the midst of dramatic budget cuts so we didn’t have the luxury of being sidetracked by a master plan,” he said. Colegrove first assessed what space was used and what wasn’t. With 22,500 square feet, the library had only 2,000–3,000 square feet open for collaboration. “There was way too much stuff in a fairly small space and certainly not enough room for the users,” he said. A patron usage study revealed that students and faculty mostly accessed electronic versions of journals, but print journals took up more than half the library shelf space. Officials decided to warehouse low-use items in an automated storage and retrieval system, opening up 18,000 square feet. To furnish the space, the library team picked up surplus UNR furniture, inventory from the closed Getchell library next door, and surplus from the county school district. Students liked whiteboards, but each 6-by-4-foot board cost $500. The solution was to cover walls with “Idea Paint,” whiteboard paint that cost $500 per 100 square feet. “There’s something just plain fun about an entire wall you can write on,” Colegrove said. SparkFun’s Toolkit ($60) and Inventors’ Kit for Arduino ($100) were purchased for electronics prototyping. Since the average science and engineering book costs $300, with overhead costs for handling and maintaining it, a lifetime cost of $500 of that average book made the expense of purchasing three kits seem reasonable. To justify purchasing two professional 3D printers (one color for $20,000 and one monochrome for $4,500), Colegrove noted some individual journal subscriptions can cost more than $3,000 per year, with at least one engineering journal running more than $100,000 per year. “We put the printers and scanner in the entry lobby for all to see, to use, to talk about, to think about; it’s about marketing,” said Colegrove. They hit their lifetime cost/use target of more than 1,000 uses after four months. Prior to the change, hourly head counts in the library peaked at 24. Now they average more than 200 and are expected to reach the rated capacity of 400 by spring finals week. The university community collaborated to make the makerspace happen. Dean of University Libraries Kathlin Ray was very supportive, and an assistant dean secured an internal grant to fund the 3D printers. The Knowledge Center managed the intake of thousands of linear feet of material from the Science and Engineering Library. “I see students and faculty actively engaged in the library. I’m just thrilled that it’s happening in DeLaMare Library,” said Colegrove. Each of these approaches started with ambition. 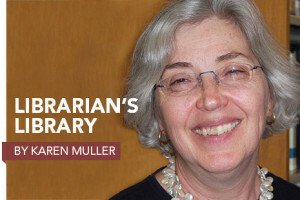 Whether it was through creative partnering, inventive central planning, or scrappy entrepreneurialism, these librarians found their way. Prolific author Cory Doctorow envisioned a makerspace revolution in his 2009 novel, Makers. American Libraries Editor and Publisher Laurie D. Borman caught up with him during his cross-country tour to promote his new book, Pirate Cinema. American Libraries: In Makers, one of your characters says, “Every industry that required a factory yesterday only needs a garage today. It’s a real return to fundamentals.” Do you think this is what library makerspaces are—a return to fundamentals? Doctorow: One of the things that I hope makerspaces can do in libraries is show people how the information works at the bare metal and to understand what is going on underneath all those abstraction layers with the technology that they use, and to take ownership of the devices and technology around them. One of your characters says makers are like 5-year-old kids. Is that the way libraries should encourage making—unleashing the 5-year-old in you?Absolutely. That’s the gateway drug to it. Being able to go in and take a tool and make it suited to your own hand is a thing that we’ve been doing since we started creating axes. How do you want to influence the development of makerspaces? Makerspaces do a very good job of being welcoming to people who are of a technical bent. But they have yet to figure out a way of sorting out how to appeal to nontraditional audiences. I think that [librarians should be] actively pursuing ways to help people who are from nontraditional audiences in your hackerspaces, find the thing that they need to do and show them how to do it. What would you say are essential elements of a library makerspace? Throwing smart, enthusiastic kids—who have received a little bit of mentorship—at a mountain of e-waste is the best way to get going, I think. Particularly if you can partner up with places that need computers. If you can get started turning e-waste into functional computers, your problem isn’t going to be making computers run; it is going to be getting rid of them fast enough. What are some likely businesses or organizations that could serve as fruitful partners in a library makerspace endeavor? Apart from the obvious, open-source hardware manufacturers would be one. Another good source would be whoever is in charge of your local e-waste recycling. Make magazine, of course, is another. Local vocational programs, local shops, and local unions, particularly trade unions. Also, parents who are freaked out that their kids go to schools where the chemistry [class] just allows them to make crystals from super­saturated solutions and actually want them to be curious about the world—they would make natural volunteers. The Gowanda Ladies Social Society formed to quilt, knit, sew, socialize, and talk about books. In 1877, it became the Ladies Library Association, receiving a state library charter in 1900 as the Gowanda Free Library. Frances Jenkins Olcott, children’s department head, helped to establish home libraries in working-class houses, where she organized crafts such as sewing or basketry for local kids. Created as a meeting place and resource connecting people to crafts, the Manitoba Crafts Museum and Library in Winnipeg is dedicated to preserving the province’s cultural heritage and teaching students how to craft. Funded for FY1960 by the Library Services Act of 1956, the Nebraska Library Commission (then known as the Nebraska Public Library Commission) in Lincoln hosted a variety of special activities, including creative arts, that were organized by area groups. The Rebuilding Together Central Ohio Tool Library was created by Columbus as the tool-lending library with a federal community development block grant. In March 2009, Rebuilding Together Central Ohio took over operation of the library. The newly renovated and expanded Merrimack Public Library opened with a children’s craft room. The first 21st-century makerspace opened in Fayetteville Free Library. It was the first of its kind in a public library and includes a 3D printer that works in a mobile capacity. Tabletop-size milling machine that can drill holes and mill small parts and prototypes from a designer’s plan. Modela can also scan a part and then replicate it on demand. A carbon dioxide laser that cuts through plastic and other materials, up to a quarter-inch thick. The cutter can also be used to engrave text, graphics, and photos on a variety of materials. Computer-guided router makes complicated cuts in wood. It can carve complex designs for furniture and letters for signs. An open-source electronics platform or board and the software used to program it. Arduino is designed to make electronics more accessible to artists, designers, hobbyists, or anyone else interested in creating interactive objects or environments. Able to generate 3D objects that can be used for parts or prototypes. Uses a fine-tuned blade to cut thin materials. It can cut vinyl, cloth, cardboard, and thin metals such as copper sheets to make electrical circuits. Machine prints and binds a paperback book in a few minutes. The technology can be used for self- and custom publishing as well as on-demand titles. Through its EspressNet digital catalog, users can choose from more than 7 million in-copyright and public-domain titles. n Hackerspaces.org: A wiki that includes a listing of active hackerspaces, upcoming events and classes, hacker contact information, and a blog of interesting hacker projects. n January 7, 1 p.m. Central time. “Learn About Makerspaces from the Innovators at Carnegie Library in Pittsburgh.” To register, visit goo.gl/oZYUR. Or to view previous webinars, go to alapublishing.webex.com. The publisher of MAKE magazine, a panel of Maker Camp veterans, and other experts will share their insights and experiences at Maker Camp Monday at the ALA Midwinter Meeting in Seattle on January 28, 2013. The first session will be a discussion on the Maker Camp pilot program, a six-week online summer camp for teens ages 13–17 that taught them how to complete 30 projects in 30 days. A number of libraries from across the country participated in the program and four will share their experiences on integrating Maker Camp into their summer programs. In The New Stacks: The Maker Movement Comes to Libraries session, Dale Dougherty, founding editor and publisher of MAKE magazine, and Travis Good, a contributing ­writer for MAKE magazine, will ­discuss do-it-yourself (DIY) culture and how it can help libraries. ­Informal play and Q&A sessions are also available throughout the day with Steve Teeri of the Detroit Public Library in the ­Networking Uncommons area.